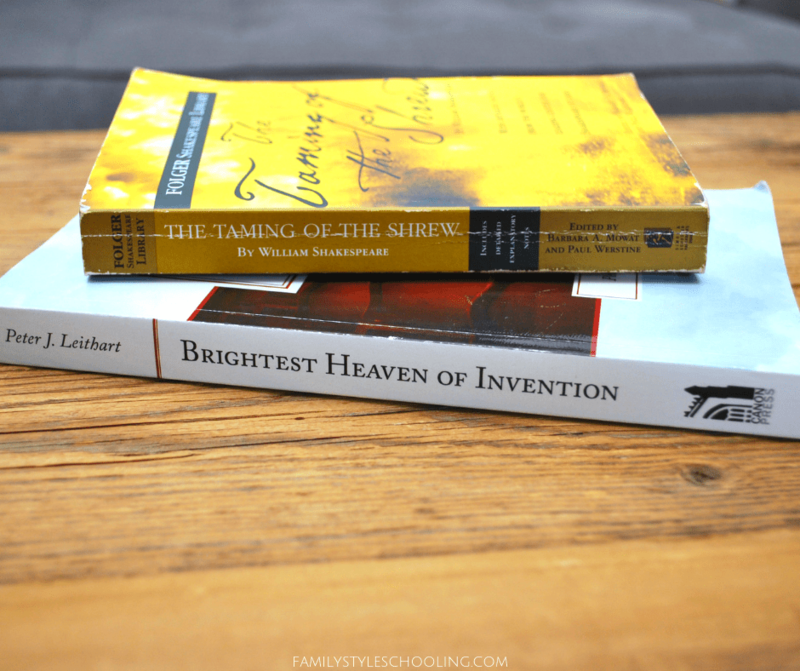 My Challenge I class just started reading through Shakespeare's Taming of the Shrew this semester. While I've read this play before, I finally picked up Peter Leithart's Brightest Heaven of Invention: A Christian Guide to Six Shakespeare Plays and I feel like my understanding of the characters and happenings has been blown wide open. Leithart is changing how I look at Shakespeare, the world, and the power of words. If you haven't read this play (or watched the movie), this little summary of the story might have a few spoilers. Consider yourself warned. In the Taming of the Shrew, a wealthy merchant, Baptista, has two daughters, Katherina and Bianca. Bianca is surrounded by men who want to marry her, but her father will not let her marry until her older sister Katherina marries. When young Lucentio arrives in town, he sees the beautiful Bianca and joins the scores of suitors eager for her hand. As you can imagine, this situation has made Katherina feel unloved, unwanted, and unloveable, so she decides to act the part and is a shrew to all around her. No man wants to get near her until another man arrives in town, Petruchio. His father has just passed away, and he'll marry any woman as long as she's rich. Petruchio proves to be a perfect match for Katherina, and he tames the shrew. At first when my class read through this play, we were a little off put by the idea of Petruchio subduing Katherina and making her a perfect submissive wife. His ways are unconventional and we really struggled with Shakespeare's presentation of what a perfect wife should actually look like. Often this is what happens when a modern reader with our Western mind tries to read a classic text. We try to fit the ideas into our current culture and they clash in a way that makes us want to instantly throw them out. However, this rash reaction can cause us to miss beauty that is just waiting to be unveiled. Enter culture guide - Peter Leithart. In Challenge III, when students read five Shakespeare plays, they're given this book by Peter Leithart to read: Brightest Heaven of Invention: A Christian Guide to Six Shakespeare Plays. 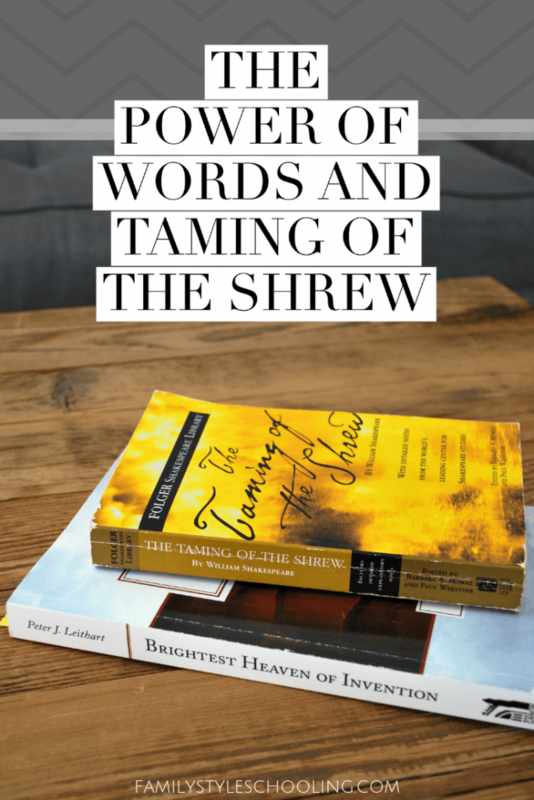 The sixth play that Leithart walks his readers through happens to be The Taming of the Shrew. When I discovered that little gem in a book I already owned, I thought it might be worth reading as I walked my Challenge I class through the play this year. I feel like this story has been unlocked for me in an incredible way, and I just can't stop thinking about the beautiful truths in this story. I'm going to share with you my favorite so far. Really, if you're reading this play, you need to get this book. One thing we really struggled with initially was the way the Petruchio "tamed" Katherina. His words seemed harsh and demeaning. However, Leithart presents Petruchio's words in a different light. Petruchio starts his "wooing" of Katherina with what seems to be a power struggle. He calls her "Kate" which drives her crazy. Leithart explains that naming something is an assertion of authority. When Adam named the animals, he gained authority over them. In the same way, Petruchio begins his taming with an assertion of authority. It's not just that simple though. Not only is Petruchio asserting his authority, he's also exploring the idea of a name giving identity. He's calling her to change from the shrew that everyone avoids to a woman of honor and dignity that people will respect. In his crazy way he's convincing her of her worth. The power to become a new person does not lie sleeping inside her, waiting to be awakened by a kiss from Prince Charming; that power comes from outside. It comes as an invitation to accept a new reality; it comes from the word. By offering a new reality with his words, Petruchio offers Katherina hope that she and her circumstances can be changed. The Bible begins the creation story by speaking things into being. We know from John 1 that the Word was in the beginning and all things were created by the Word. Our culture has cheapened words and believed a lie that words are harmless. Yet we're harmed by words almost every day. The words on someone's Facebook feed, "harmless" jokes from a friend, or careless responses in serious conversations can wound more than we'd like to believe that we let them. What Petruchio does in their battle of wits and puns is he paints a word picture and then calls her to live up to it. He presents a possibility of what she could be and allows the healing power of words to create a new image for her, one that she's not forced into taking, but wooed into enjoying. In this battle of wits where crazy Petruchio takes on shrewish Katherina, something wonderful happens: they fall in love. It is not that Petruchio tames the wild stallion or that Katherina succumbs to be the object of his affection, but the two find in one another hope and healing through the power of love. This is a horrible paper. I didn't spend much time on this one. This is the worst paper I've written. I could go on. It's not setting your presentation up for being well received. It's like saying, "This tastes awful. Try it!" I find that I fall into this trap frequently. When I have expectations of my kids to perform in a certain way, I can speak correction in excess. Yes, I need to correct them, but if that's all that they're hearing, that's all that they will know that I believe. I need to use my words to speak life, hope, and love to my kids. I can create with my words an image of how God sees them in Truth. Petruchio and Katherina have truly impacted my thinking about the power of words in a life. While I can speak all the beautiful words I can think of over my kids, the reality is that it takes a work of God to change a person. Truthful, beautiful words need to be saturated in prayer and given time to take root, blossom, and grow. This work of taming the shrew inside of us will take patience and grace. It will also take some purposeful contradictions of what the current culture tells us truth is. That may prove to be the most difficult shrew to tame.